As I was driving along the other day, something unusual caught my eye. It was a propane tank beside a house. No, there isn’t anything unusual about a propane tank near someone’s house. 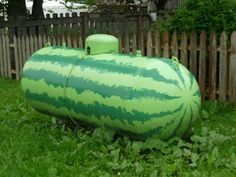 It was the fact that this particular propane tank was painted to look like a watermelon! I don’t think it fooled anyone. Even a raccoon with a below average IQ would realize that this was not a huge watermelon. No amount of paint could make any reasonable person decide that this was anything other than a propane tank. Some people try to paint themselves up to look like Christians. They might fool some people. They might even fool themselves. Most people are at least somewhat susceptible to self-deception. However, we can’t fool God. Jesus warns against hypocrisy. Let us always be examining ourselves to see that we aren’t trying to pass ourselves off as something we are not. Let us be honest with ourselves, honest with others and honest to God. “Do not lie to each other, since you have taken off your old self with its practices and have put on the new self, which is being renewed in knowledge in the image of its Creator.”—Colossians 3:9-10. This entry was posted in Christian Living, Communion Meditations, Leadership and tagged being fake, Colossians 3:9-10, honesty, hypocrisy, illustration, lying, propane tank painted like a watermelon. Bookmark the permalink. The watermelon tank in the picture isn’t fooling anyone, however, smiles, that really made me smile. It looks better than your average outdoors tank.